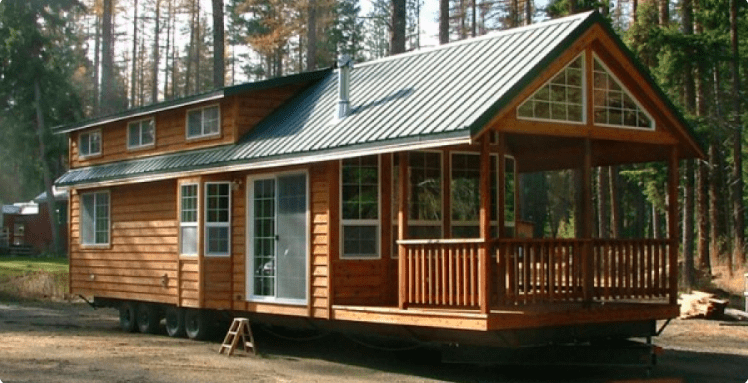 This spacious not so tiny cabin building with large windows is a small house design that is built on wheels. This tiny house space even presents a bedroom on the main level as well as an upper loft for whatever use you prefer. If you are leaning towards having a smaller home design and have always loved the warmth provided by a log house, this sort of cabin building might work for you. Portable cabin buildings are designed to be used for a variety of things from a weekend vacation home, hunting cabin building, or a rental unit in an RV park or resort. The portable cabins would also make a great backyard casita for when you have friends or family or to visit, or for use as a backyard office or artist studio. Most of the portable cabin buildings have minimal kitchens (basically a kitchenette), and most of them combine the living/sleeping areas. There is a loft model portable cabin building that separates the living areas from the sleeping areas or that allows for more sleeping areas. There are several two bedroom models, one three bedroom model and one duplex model portable cabin building. There are different models of portable cabin buildings available to suit your lifestyle and needs. If you love to cook and are concerned that a small house design may not provide enough space for a decent sized kitchen, you might just be surprised. While the kitchen in the portable cabins isn’t the largest of kitchens, it offers a kitchen countertop, sink, stove, and fridge, which are everything you would need to prepare delicious meals. The bathroom is a full bathroom including a bathtub and a shower. Like many tiny cabin designs, the portable home design has an open concept living area so that space feels a little roomier, as well as a loft area for extra sleeping or storage. One of the portable cabin buildings available is the Miller which combines great features in a compact design for tight installations. The bedroom is in the loft of this portable cabin building, with a large living room that will fit a lot of your furnishings. The kitchen appliances are apartment size in a fully functional kitchen for all your cooking needs. There is also a laundry center and a large sized bathroom with a tub and shower. The loft sleeping area allows you to stand up which is a very popular option. The Miller portable cabin building has 312 square feet of space, is 26 feet long by 12 feet wide. If you need a bit more space a park model cabin building might be the choice for you. Park Model homes are typically designed to be used as a recreational secondary home. Most park models are full sized being about 400 square feet and are offered with or without a loft. These park model cabin buildings feature amenities such as kitchens with full-size appliances, spacious bathrooms, a sleeping loft with lots of head-room, real stairs, a downstairs bedroom and plenty of storage. They can also be loaded with additional options of your choice. Rich’s Portable Cabins have a variety of tiny house designs to include park model tiny home designs, tiny homes, and portable cabin buildings.